This ImageDraw demo - which source code files can be found at the end of this page available for downloading - demonstrates how you can use ImageDraw to design a Multipage TIFF Viewer in ASP.NET. 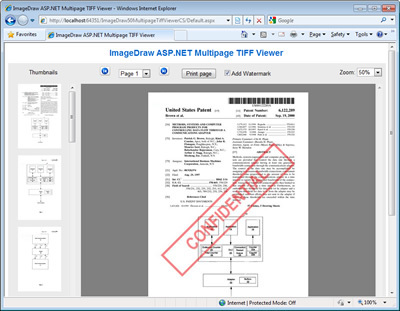 The following figure is a screenshot of the ASP.NET Multipage TIFF Viewer. This sample lets users to examine all pages in a multipage TIFF image as well as to dynamically add a watermark. Here are the VB.NET and C# versions of this sample. Please download the zip file and extract it. After that, you'll find all necessary files to reproduce this demo. Remember to download and install ImageDraw for ASP.NET in order to reproduce this sample demo.